I've mentioned a few times recently that I have a new found fascination with yeast breads, and that I have been reading through the well-known and -loved The Bread Baker's Apprentice to teach myself the craft. I finally made my way through Peter Reinhart's patient, friendly, and brilliant explanation of everything bread-related, and only when I finished those introductory chapters did I allow myself to start making bread from his now-classic book. 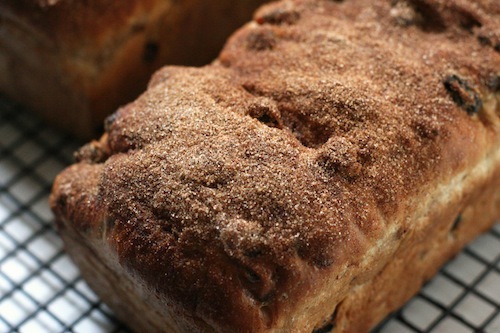 The first recipe I picked, after careful consideration, was Cinnamon Raisin Walnut Bread. I'm telling you, making bread is a transcendent experience. Especially after reading Reinhart's description of how bread-baking is a sort of alchemy, weighing out ingredients, watching the dough rise, forming loaves, baking, waiting through the painful cooling period, and finally taking the first bite were all magical. If you're looking to get into baking bread, this recipe is a great place to start. But it will mean so much more if you get your hands on a copy of The Bread Baker's Apprentice and read it for yourself. 1. Stir together the flour, sugar, salt, yeast, and cinnamon in a mixing bowl (or in the bowl of an electric mixer). Add the egg, shortening, buttermilk, and water. Stir together with a large spoon (or mix on low speed with the paddle attachment) until the ingredients come together and form a ball. Adjust with flour or water if the dough seems too sticky or too dry and stiff. 2. Sprinkle flour on a counter, transfer the dough to the counter, and begin kneading (or mixing on medium speed, switching to the dough hook). The dough should be soft and pliable, tacky but not sticky. Add flour as you knead (or mix), if necessary, to achieve this texture. Knead by hand for approximately 10 minutes (or by machine for 6-8 minutes). Sprinkle in the raisins and walnuts during the last 2 minutes of kneading (or mixing) to distribute them evenly and avoid crushing them too much. (If you are mixing by machine, you may have to finish kneading by hand to distribute the raisins and walnuts evenly). The dough should pass the windowpane test and register 77 to 81 degrees F. Lightly oil a large bowl and transfer the dough to the bowl, rolling to coat it with oil. Cover the bowl with plastic wrap. 3. Ferment at room temperature for approximately 2 hours, or until the dough doubles in size. 4. Divide the dough into 2 equal pieces and form them into loaves. If desired, before rolling the loaves, sprinkle the dough with a mixture of 1/2 c granulated sugar and 2 tbsp ground cinnamon, creating a cinnamon-sugar swirl. Place each loaf in a lightly oiled 8 1/2 by 4 1/2-inch pan, mist the tops with spray oil, and cover loosely with plastic wrap. 5. Proof at room temperature for 60-90 minutes, or until the dough crests above the lips of the pans and is nearly doubled in size. 6. Preheat the oven to 350F with the oven rack on the middle shelf. Place the loaf pans on a sheet pan, making sure they are not touching each other. 7. Bake the loaves for 20 minutes. Rotate the pan 180 degrees for even baking and continue baking for another 20-30 minutes, depending on the oven. The finished breads should register 190F in the center and be golden brown on top and lightly golden on the sides and bottom. They should make a hollow sound when thumped on the bottom. 8. Immediately remove breads from their pans. If desired, brush the tops of the warm loaves with melted butter and roll the tops in cinnamon sugar. Cool on a rack for at least 1 hour, preferably 2, before slicing or serving.